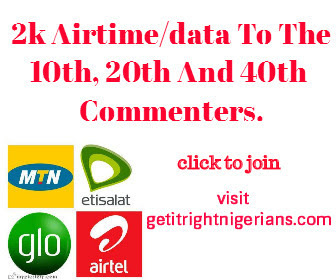 Home / Unlabelled / Weekend Giveaway - 2k Airtime/data To The 10th, 20th And 40th Commenters. Weekend Giveaway - 2k Airtime/data To The 10th, 20th And 40th Commenters. Two thousand Naira airtime or data bundle will be given to the 10th, 20th, and 40th commenters on any of the blog's articles. NOTE : These comment space must a be reached for before each winner would be given their recharges or data bundles i.e if there is a 10th commenter without the 20th and 40th commenter, the prizes won't be given. 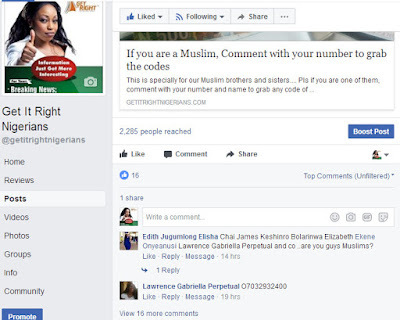 Until there is a 10th, 20th and 40th Commenter on the platform. This is done to enable equity. Let the comments begin to roll in, invite friends to join to make your chances greater. Remember the more people we have, the more games we would motivated to play and the more you will gain also. If you are yet to join our fanpage or download our mobile app, then you should so now to make commenting easier for you. How do I register please? you never comment for any post, we go just send you recharge cards, na jazz you de use? lol... Iam_DeoGrat!as we have not seen your invitees oh... you know say na you be baba for her now, so you have a responsibility towards us too. They are already here.. I have 2 already and still counting..
Good morning everyone, it's nice we are all here. Admin you are doing a great job to be sincere, God bless you more.